Say goodbye to boring desk lunches and brace yourself because these Gluten Free Instant Noodles with Kimchi are going to blow your mind and really liven up your midday meals! Consider these Instant Noodle guidelines just that…guidelines. It is so easy to swap up the flavors and textures to make your own variations based off of what you like. The options for these noodle cups are literally endless, and always delicious! The noodles || Considering the noodles are THE most important part of this entire Gluten Free Instant Noodles post, we should probably talk about them first. I happened upon brown rice ramen noodles a few years ago during a deep dive on Google. Ever since I have been sending Todd to work with lots of different home made variations of gluten free noodle cups during the cooler months. He loves them and I love how simple it is to make a week’s worth of wholesome lunches at one time for him. 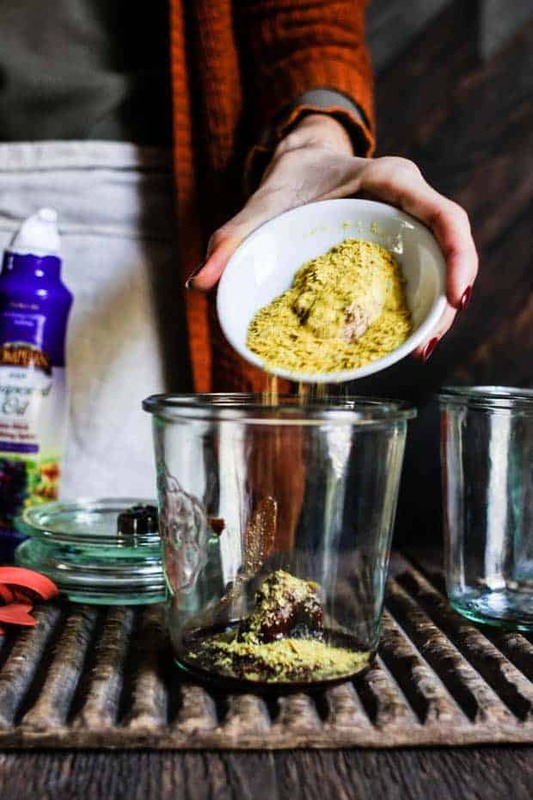 I parcook the ramen noodles for these noodle cups for only a few minutes, rinse them under cold running water, thoroughly drain, then lightly spritz and toss them with Pompeian 100% Grapeseed Oil Spray. This will keep the noodles from sticking together. 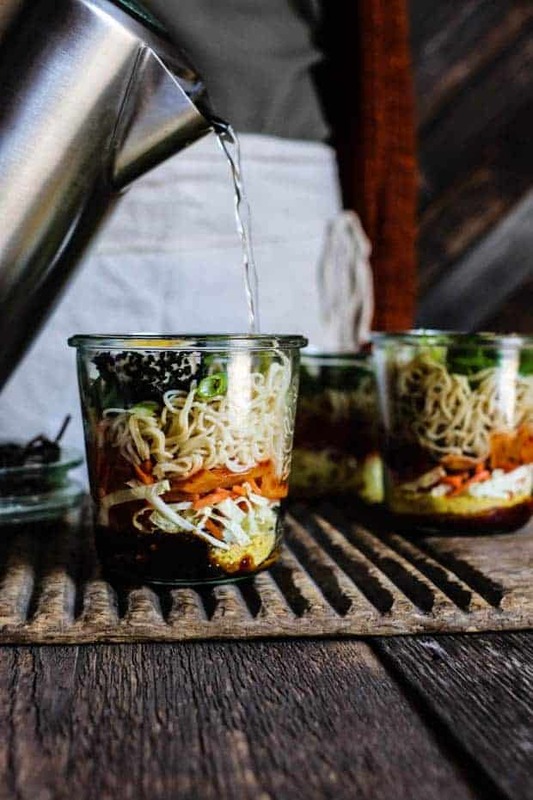 Then once you are ready to eat all you have to do is simply pour boiling water into the glass jar and allow the noodles to steep for 1 minute before you stir everything together and eat. 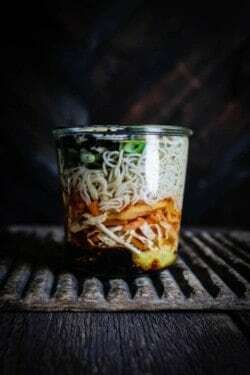 The flavorings || There are all sorts of flavor combinations for noodle cups out there, but Todd and I have been enjoying Korean flavors the most lately. Kimchi is the standout flavor in this version. Kimchi is a staple side dish in Korean cuisine and is made of salted and fermented vegetables. Since Todd is a vegetarian I use a vegan kimchi that he really likes since kimchi is often made with salted shrimp, fish sauce, or anchovy sauce. The other flavorings in these delicious instant noodles with Korean influence are gochujang, a red chili paste that is a savory, sweet, and spicy fermented condiment; gluten free miso paste, which has a salty, umami-rich flavor; and Tamari, a gluten free soy sauce alternative. The vegetables || The vegetables are the really fun part because they can be swapped up about a million different ways. My holy trinity for any gluten free instant noodles are sturdy greens, shredded carrots, and green onions. For the greens I rotate between finely shredded Napa or Savoy cabbage, bok choy, and spinach just depending on what I have on hand, but I never swap out the carrots or green onions, they’re essential flavors in the noodle cups. The protein || Lots of times I just send Todd with noddle cups filled with vegetables, but sometimes I add cubed tofu or hard boiled eggs into the jars for him as well. If you eat meat you could change it up by adding in a layer of shredded chicken too. 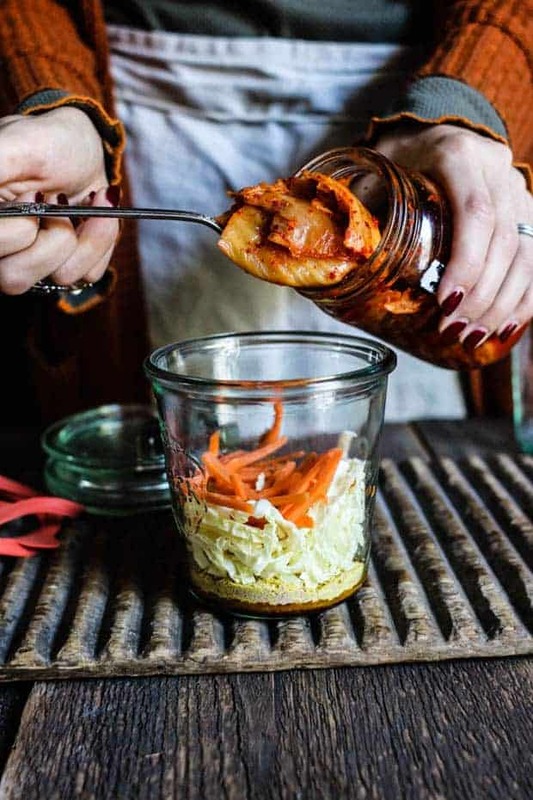 If you’ve made these Gluten Free Instant Noodles with Kimchi or any of the other recipes on our site, don’t forget to rate the recipe and let me know what you thought in the comments below, I love hearing from you! You can also FOLLOW ME on FACEBOOK, INSTAGRAM, TWITTER, and PINTEREST to see more delicious food, design, and decor. 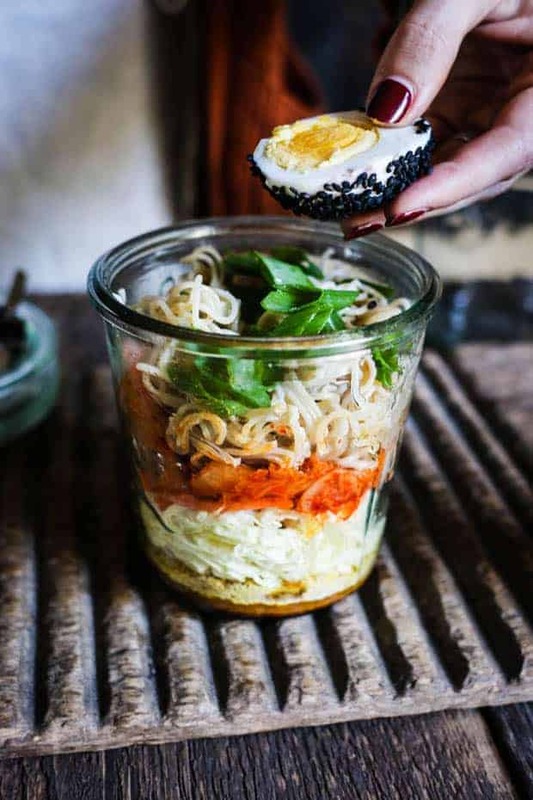 These Gluten Free Instant Noodle jars make for a pretty perfect desk lunch or a thoughtful gift for a friend that is under the weather. 1 nest gluten free brown rice ramen noodles, par cooked for 1 minute less than the package indicates. Miso paste, Tamari, gochujang, nutritional yeast, and ground bouillon cube. Top with shredded greens, carrots, and kimchi. 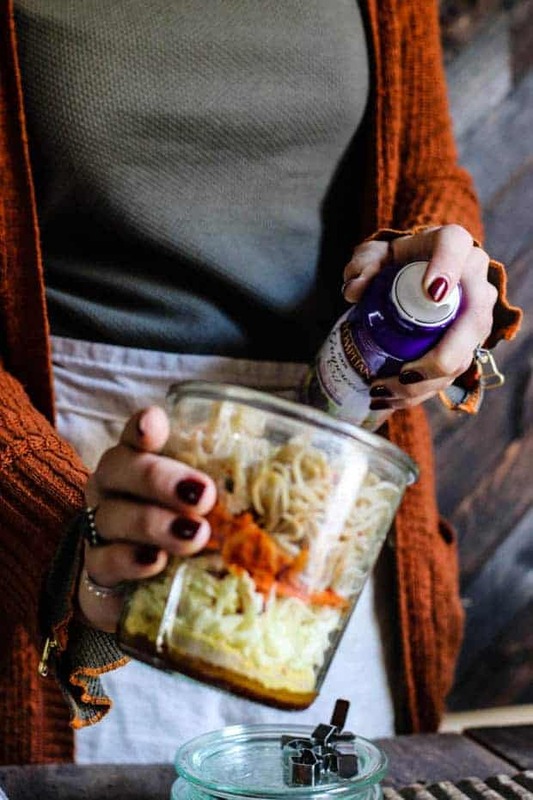 Lightly spritz par cooked ramen noodles with Pompeian 100% Grapeseed Oil Spray before adding to the jar. Layer in the choice of protein and top with scallions. Place a lid on the jar and store in the refrigerator for up to 5 days. To serve: Add boiling hot water to the jar, leaving about an inch of space at the top is you can stir the soup. Let sit for 1 minute. Stir to incorporate all of the seasonings from the bottom of the jar. Eat immediately. Which brand of noodles did you use in this recipe? Hey Kate, I use King Soba ramen noodles. They have brown rice and black rice ramen. Both are great! I can’t wait to try. Where did you get the glass jars with lids? I just KNEW this could be done. I just hadn’t put much thought into making it happen. Thank you SO much for this recipe. It will be nice to have this to add to the weekday lunch arsenal for me and hubby. I just ordered the jars. So excited! Hooray!! I am so glad that you are excited about the recipe Marlene, I hope you love these as much as we do. I’m sure you will be making up your own noodle cup variations in no time – be sure to come back and tell me all about them!